From January 1, 2020 Singapore will ban the use of open-loop scrubbers in its waters due to environmental concerns over the technology. "To protect the marine environment and ensure that the port waters are clean, the discharge of wash water from open-loop exhaust gas scrubbers in Singapore port waters will be prohibited," Andrew Tan, Chief Executive, Maritime and Port Authority of Singapore (MPA) said today at the Singapore Registry of Ships (SRS) Forum 2018. 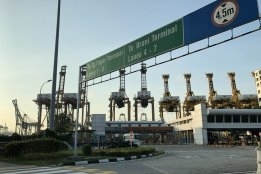 "Ships fitted with open-loop scrubbers calling at Singapore will be required to use compliant fuel. Ships fitted with hybrid scrubbers will be required to switch to the closed-loop mode of operation. Singapore, as a party to MARPOL Annex VI, will be providing reception facilities for the collection of residues generated from the operation of scrubbers." Scrubbers allow vessels to burn otherwise noncompliant high-sulfur bunkers. While nothing new, the technology has gained significant attention this year due to the upcoming "IMO 2020" global 0.50% sulfur cap that comes into force from January 1, 2020. Scrubbers work by removing SOx from exhaust gases after combustion. Open-loop scrubbers use seawater to "wash" sulfur from the exhaust gases. This washwater is then discharged back into the sea. Closed-loop systems keep the washwater onboard for discharge at a suitable facility. Hybrid scrubbers can operate in either mode. The move comes after a period of increasingly harsh criticism of the technology's environmental credentials, with sceptics and scrubber manufacturers alike having already anticipated open-loop scrubbing was vulnerable to future regulation. Advocates, including the newly-formed IMO 2020-focused marine scrubber advocacy group, Clean Shipping Alliance 2020 (CSA2020), last month prevented results from a number of scientific studies to back up its assertion that scrubber washwater is not harmful to the sea. And speaking to Ship & Bunker earlier this month, Don Gregory, Director is Exhaust Gas Cleaning Systems Association (EGCSA), said there was "no short term or cumulative" negative impact from scrubbers. MPA's decision is likely to have far reaching effects as Singapore is by far the world's biggest bunkering port by volume. With sales of 50 million mt/year it accounts for some 16-20% of the entire global bunker market. The uptake of scrubbers has also surged this year, with DNV GL saying last moth there are now 1,850 vessels with installed or confirmed orders for scrubbers. Due to this growing popularity, some have suggested that Singapore's open-loop scrubber ban could hit the port's bunker sales. "Singapore's bunker market could lose out to competitive bunkering locations emerging in surrounding locations ... provided they allow open-loop scrubbers to operate," Reuters quoted Ashok Sharma, managing director of shipbroker BRS Baxi, as saying.